Built in 1917 for the son of Aurelius S Hinds. 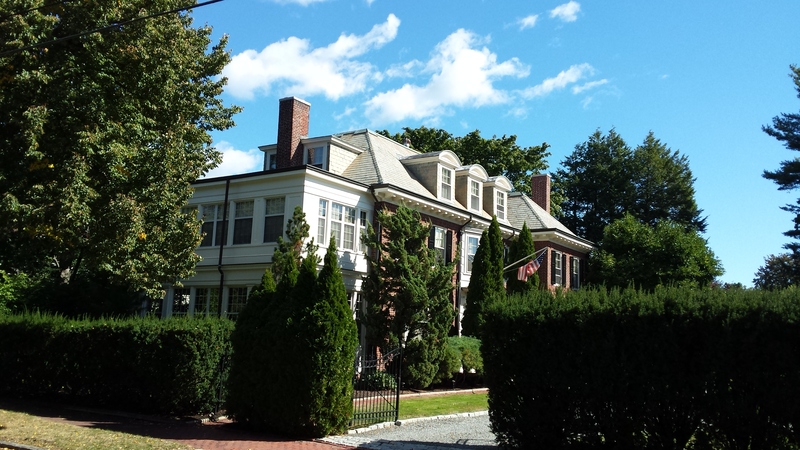 A very large Colonial Revival pile designed by George Burnham and Leander Higgins. Situated with it’s gable to the street as is quite common in the West End, the primary facade addresses the entry court. And what an entry court it is! 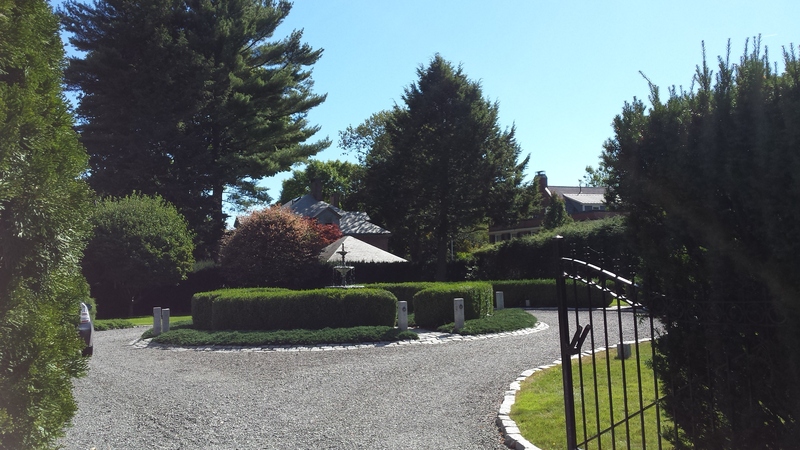 Complete with circular drive, par terre & fountain surrounded by a high, clipped yew hedge. Natch. The house is 3 story rectangle with a balanced but asymmetrical facade. The right bay projects from the block. The porches on the left were originally closed on the first floor and open on the second. The hipped slate roof sports 3 well scaled dormers with compressed, classical, arched roofs. Just visible above the 2nd story porch is a small, shed roofed dormer. At first I questioned it’s originality to the building. it seems a bit out of place. The 1924 tax photo shows it and makes it even more incongruous looking. Man, those were some beautiful street lamps. The tax photo gives a much better view of the facade. The entry bay has a gentle outward curve more Federal that Colonial. The use of white paint on the bay and all trim brings the feel back to the Colonial somewhat. The first floor windows are nicely sized and help the wall to window balance. The right bay is more anomalous than ever. 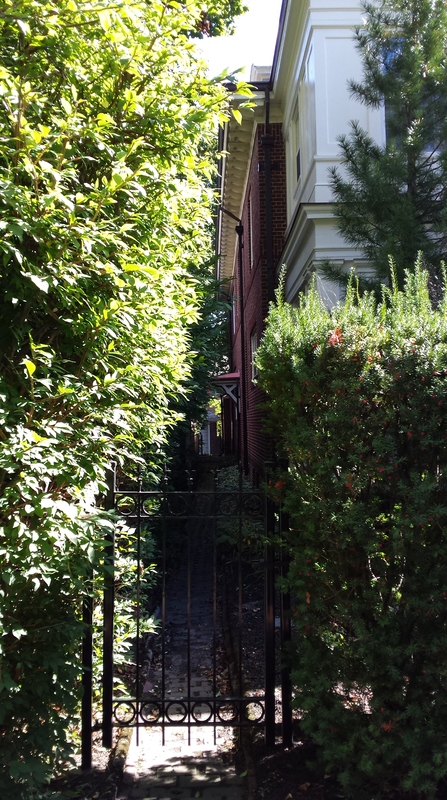 Perhaps the desire was to capture more sunlight on that end. Perhaps it was a desire for more floor space. Whatever the reason, the results are off balance and uncomfortable. One of the things my modern eye notes about the West End is how these quite large houses are pushed right to the edges of their lots in many cases. The image above shows the back wall of 27 Chadwick on the right. The property line is just to the left of the image. There is no more than 8′ between them. I guess there were no set back rules in early 20th century Portland. The house remained in the Hinds family until the death of Charles’ wife Augusta in 1989. The current owners purchased the property from her estate. 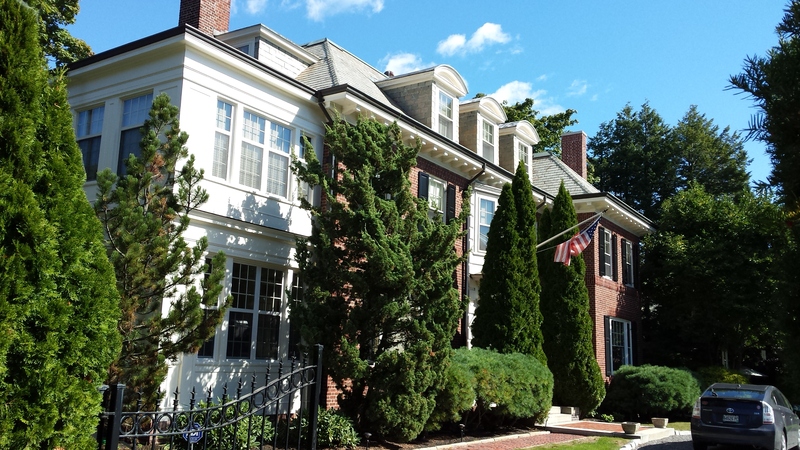 This entry was posted in Architecture, Brick, Chadwick Street, Colonial Revival, History, Images, West End Walks and tagged Architecture, Brick, Colonial Revival, History, images, Maine, Portland, West End on October 2, 2016 by alewifecove. Please edit with the correct address of the Charles B. Hinds house. Perhaps you erred because my grandfather purchased two lots. Please also note the correct name of my grandfather, who built this house, is Charles B. Hinds. He was the son of Aurelius Stone Hinds. Thank you for the information. I have corrected the article.